For me, the axle breaking and the subsequent waiting period felt like a big test. Like the universe was really testing us to see how much we really wanted to do this expedition. And what that week (and the previous eight months of planning and prepping) proved to me was that Lauren and I (and Morgan) were willing to fight for it. We had not come this far just to let our big adventure slip through our fingers. We would adapt, iterate and keep moving. 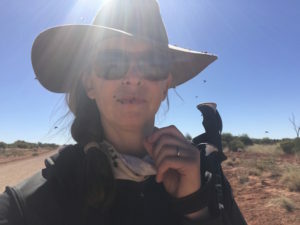 After we hitch hiked back to Yulara, I drew up the axle plans on the fly, in the hotel lobby with busy tourist buses filling and unwilling around me. I detailed the design on a scrap piece of grid paper with a 6inch ruler and sent it back to great mate, Tony Geros and his company Tri Point Rigging to get made up for us– they’re the welding genius that made my cart and retrofitted Laurens/Morgans to be able to take on this terrain which is not an easy task. Finally, after six days of waiting, our three (one extra thrown in for good or more accurately bad luck) brand new, stronger, machined hi tensile steel axles arrived from Sydney. We had organized the axles to be couriered to us by good mate, axle mule, videographer and another Bondi local Ming D’arcy. Seriously, that’s his name. The marriage of a Chinese dynasty and Jane Austen’s brooding heart throb… nah ok not quite but he’s a good bloke that I first met down in Antarctica – he was filming Pat Farmer’s epic Pole to Pole journey and have since worked with him on a number of projects. Ming finally arrived, we cheered, picked him up and after quickly checking the axels fit the wheels, whooped, and headed off to set up camp at our new start point. 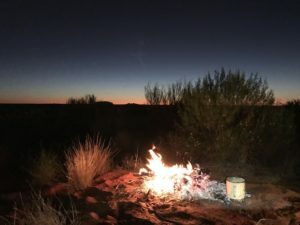 I was so ready to get back in the bush and in the real silence of the Outback, with just the three of us. 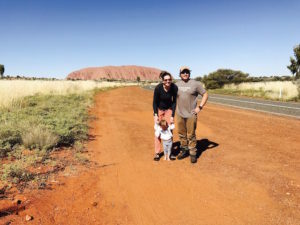 Originally our plan was to cross from the western border of the Uluru Kata Tjuta National Park, near the Olgas to the north of the Park to camp then back in to Mutitjulu – the indigenous community that we had received permission to visit and then through to the Eastern side of the Park. After having a long and heart sinking chat with the Central Land Council and the National Park before we set off, we were told that the original route we had hoped to cross was impassable. Again we would have to tack and change course. The small back route, off the highway that we were hoping to cross was a ‘mens business only’ Aboriginal site meaning no women were allowed to cross during this time of year (nor myself without supervision). 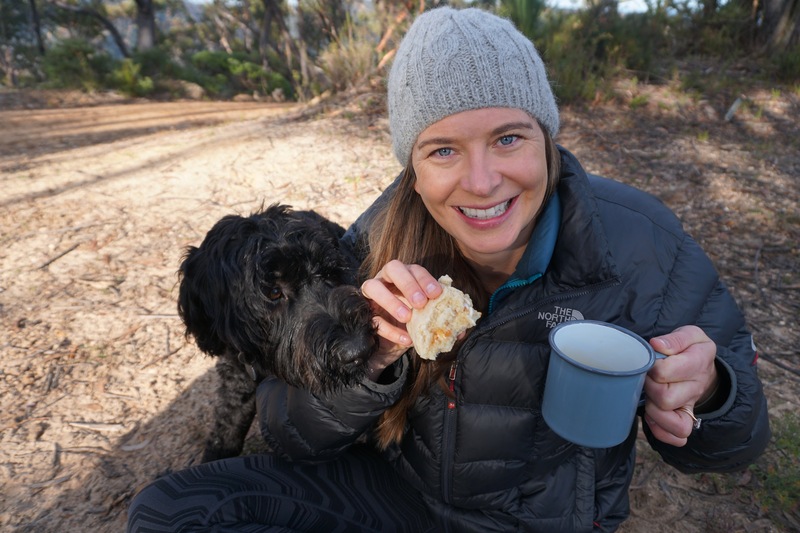 In addition, the National Park had a strict no camping policy within the boundary of the park making the two 50km stretches we needed to walk impassible to us with Morgan in tow. To add to the decision, they informed us sadly that an indigenous artist had been killed walking home on the road weeks earlier by a tour bus. Not a risk I was willing to take with my family. 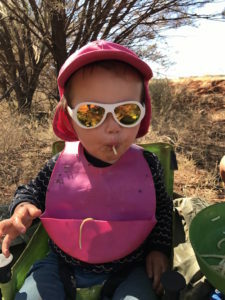 To make things a bit more tense, we were already facing a hotter than normal ‘winter’ season in central Australia (with many days now around 30C or hotter) and time was not on our side with the late start in the season that we had had. So after much discussion we made the decision to not backtrack and transit through the National Park starting on Indigenous land, on the other side of the Park, on a road that has now become my favourite in Australia; the Petermann Rd. 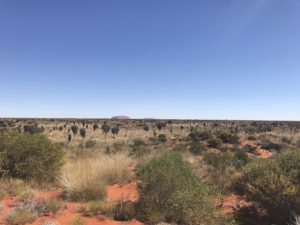 This narrow single lane dirt and sand road wound its way between sandhills, wildflowers and schrub with the omnipotent presence of Uluru and the Olgas watching us on the horizon. 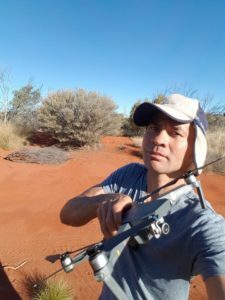 For the next two days our only companions were to be camels, piraru (bush turkeys) and countless flocks of colourful song birds (and Ming as he stayed to do a spot of filming for us too before taking our car back to Alice Springs for us– thanks Ming!). 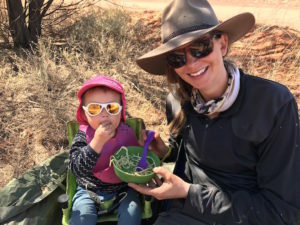 We finally headed out of Yulara, picked up our first food drop at Mutijulu (thanks for keeping it safe for us Clive and Tracy!) and I was happy to have the busy resort fall behind us and eager to get back out in the bush and back on our expedition. We woke on Sunday and started repacking and setting up our cart with the brand spanking new axles. Started setting up the carts…. Tried to set up the carts……WTF…….The axles didn’t fit. For some bizarre reason it looked like my measurements of the axle butts were 0.5-1mm off. Sure they fit the wheels which I had initially made sure of, but WOULD NOT for the life of me, not for all my swearing, not for all the graphite powder, nor the manual persuasion I could muster with a hammer, FIT IN THE FREAKING STOCKS. So close yet so far. I think I cried. OK I did cry. 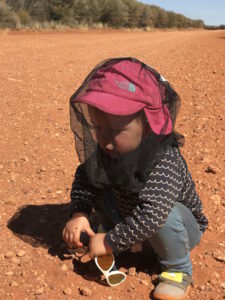 We unpacked the carts AGAIN, repacked the car AGAIN and went back to Yulara AGAIN. I am seriously over this. Deep breath…it’s fine. I’ll call the local mechanic and see if he can do me a solid and shave down the axles or widen the stocks. It’s fine that it’s a Sunday…surely with bush hospitality we can get him to come in and help us out, surely a case of beer could grease the wheels. Worst comes to worse we can wait till Monday morning. Picnic day is apparently a Northern Territory working holiday. Great for them. Bad for us. As a result no work could be done till Tuesday – two more days away and we could not afford to loose two more days. I am not waiting around for another two days. I’m going to fix this thing my self even if I have to do it with round file and 20 hours of manual labour. 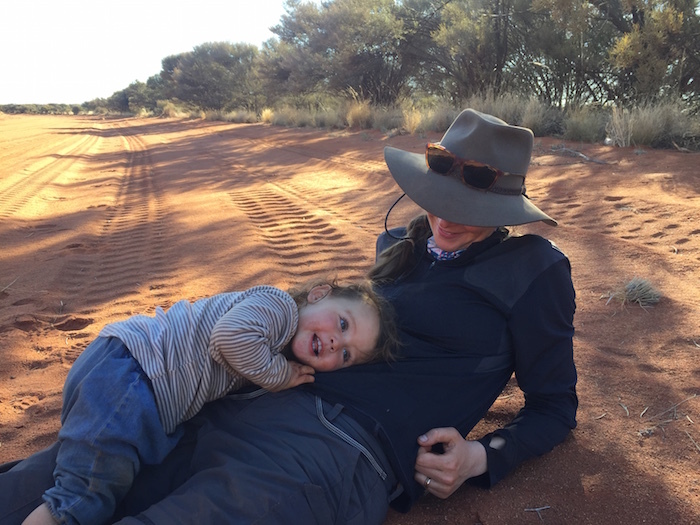 We decided to settle down for the rest of the day back AGAIN in the Yulara campground. A huge RV to our left and a Scottish family battling to put up their hired tents to our right (they were lovely…I was just kinda sh*tty that night) as this was NOT where I wanted to be camping. After calling around town, I finally managed to track down two 20mm drill bits (thank you again Clive from Maruku Arts) and at 9pm at night under the cover of darkness, emboldened by pizza, Ming and I snuck into the Sails in the Desert carpark and found an electrical box with an unattended powerpoint…YES! Dodging resort security we drilled, snapped bits and filed till the axles fit the stocks. Success! Never mind the numerous noise complaints we were back on for leaving Monday! One day saved. We left Yulara AGAIN on Monday. Our plan now was to walk the remainder of the Petermann Rd then head down Mulga Park Road to Mulga Park Station. Ming, would then drive our car 300km back to Alice Springs, leaving us again, unassisted and just the three of us. As we headed off again on the trail on day 16 it felt like we were starting the expedition all over again and back to square one even though we had already walked over 110kms. 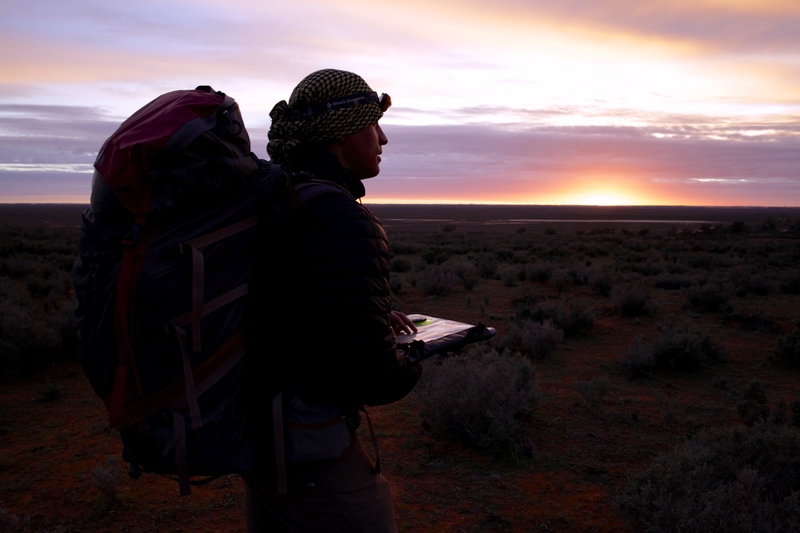 I’ve learned on my previous expeditions that you just have to keep moving forward which is what we did. Whatever was in front of us I could take it, as long as we started moving forward again, we were more than ready. As we turned down Mulga Park road, as if planned by ambush we were swarmed by an unbelievable number of flies. Like seriously ridiculous number of flies. You couldn’t open your mouth for a second without one launching itself down your throat. Lauren’s hat had at least 50 or 60 sitting on it and the back of my cart would have held at least a thousand. I felt like the pied piper of flies. Morgan when not in her cart and before she would allow us to put a flynet over her head would have at least 5 or 6 flies on each eye, drinking from the surface of them. Each time I’d look at her, it was as if her eyes were transformed into black pools.…and her eyes were getting puffy and irritated. It was horrible to see. A few hours into our walk down Mulga Park road, a friendly local pulled up next to us to have a chat. “Welcome to Sh*t country!” he said smiling as he swatted flies left and right. We had heard that walking through Station land we would get more flies due to the amount of cattle poo around but we hadn’t realized it was this bad. He laughed saying that this wasn’t even bad…we’d see bad if we wanted that to come back in Summer. Umm, no thanks. Winter is good by us. Our lunch for the next few days was cruncher than usual. The upside is that it had more protein too. 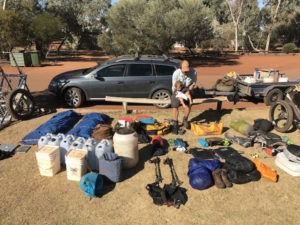 Over the next 4 days to Mulga Park Station, we slowly ground back into some form of a routine. The bodies protested. Lauren’s blisters flared back up and my left ankle decided to re-sprain itself it without any actual apparent incident to cause the rapid deterioration (a wedding dance floor injury back in 2009 was the original cause of weakness). Nothing to it but sports tape and plenty of anti-inflammatories. We could not afford to be, and would not be stopped again. Grit your teeth and bear it. 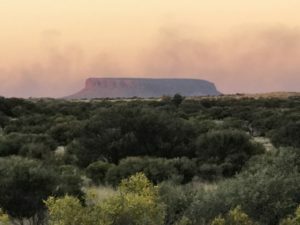 The daily grind on the trail was somewhat lessened by the occasional glimpses of Mt Connor or Attilla (spelling) which is arguably as impressive as Uluru. 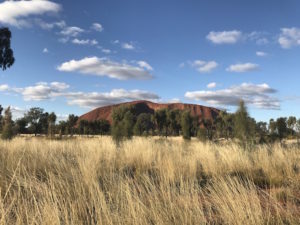 A eroded tableau that stands taller than the Rock (what the locals call Uluru) with huge significance as part of the Aboriginal Seven Sisters Dreamtime story. I was also somewhat distracted by the constant worry about the new axles. Would they hold? Had I severely underestimated the load we were carrying and made some fundamental errors with the design of the carts. I swear I could see a bend in the right axle. Was that the one that snapped before?? At least the constant paranoia took the edge of the pain from my ankle. 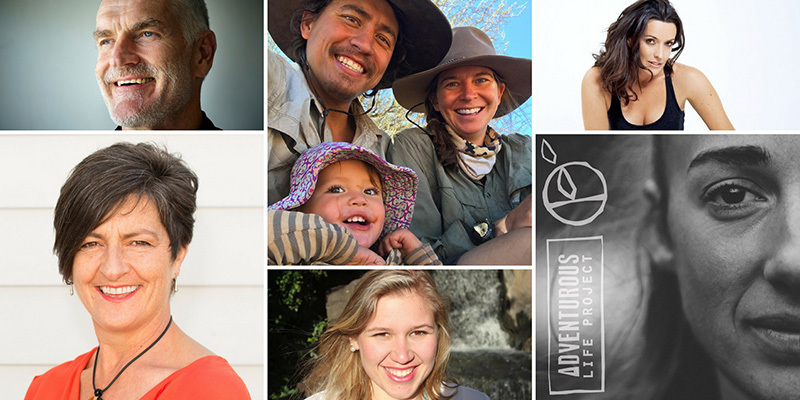 For me this family expedition has been the evolution of adventure. There are times in your life to do things solo, with mates and with the ones you love and all of these trips will take many different forms and shapes. This trip had already taken unexpected twists and turns and no doubt we were in for more. This trip was shaping up to be similar in many ways to my previous expeditions yet different in many others. All of this excited me. That is what adventure was all about. The flies persisted. The three of us continued to walk. The axle held.